IN IMPROBABLY WARM weather some 500 people gathered on February 23rd in Plaza de la Villa, one of Madrid’s oldest squares, to launch the election campaign of Ciudadanos (Citizens), one of Spain’s newer political parties. A year ago Ciudadanos, which describes itself as a centrist, liberal party, was leading the opinion polls, with around 27% of the vote in a crowded field. Now it trails behind both the governing Socialists and the conservative People’s Party (PP). Yet Ciudadanos and its young leader, Albert Rivera, may still hold the key to Spain’s next government. Mr Rivera fired the opening shot in the campaign by rejecting, from the outset, a coalition with the Socialist party of Pedro Sánchez, the prime minister since June, whom he accused of disregard for the constitution in his negotiations with Catalan separatists. In doing so, Mr Rivera has tried to define the character of the election due on April 28th. It will be about the unity of Spain and it will be a contest between the Socialists on the one hand and a three-headed block to the right of centre in which Ciudadanos has lined up with the PP and Vox, a new ultra-conservative party. A fortnight earlier this trio joined forces in a much bigger demonstration in another Madrid square, to protest against Mr Sánchez. Vox is a Spanish nationalist party that in some respects resembles far-right movements elsewhere in Europe. This is a strange place to be for a liberal party once compared to Emmanuel Macron’s En Marche in France. “I’m surprised they are putting a cordon sanitaire against me and not the far right,” said Mr Sánchez. This stance can only be understood in the “exceptional circumstances” of Spain, says Inés Arrimadas, until now Ciudadanos’s leader in Catalonia and the party’s star attraction, who announced in the Plaza de la Villa that she will run for parliament for Barcelona. In October 2017 the separatist regional administration in Catalonia held a “binding”, although unofficial, referendum and declared independence later that month in defiance of the constitution. These events amounted to a “coup”, says Ms Arrimadas. Mr Sánchez came to office after a censure motion against Mariano Rajoy, the previous PP prime minister, and with the backing of Catalan and Basque nationalists in the Madrid parliament. Mr Sánchez has attempted to defuse the conflict in Catalonia through a less confrontational attitude. Ms Arrimadas accuses him of making “concessions” to coup-mongers by failing to stop the separatists from using public resources to promote their “republic”. Ciudadanos, which was formed in Catalonia, has always had two souls: one liberal and the other anti-separatist and thus Spanish nationalist. It is still liberal on lifestyle issues and favours modernising economic reforms, but these proposals are “harder to understand” in a “polarised scenario”, says Toni Roldán, a Ciudadanos legislator. The party’s rise and its decline owe much to the political earthquake caused by Catalan separatism. In a regional election in Catalonia in December 2017 Ms Arrimadas’s muscular campaigning helped Ciudadanos win the most votes, although the three separatist groups retained their narrow majority of seats in the Catalan parliament. Because of separatist intimidation “it’s not easy being Ciudadanos in Catalonia,” she said in the Plaza de la Villa. 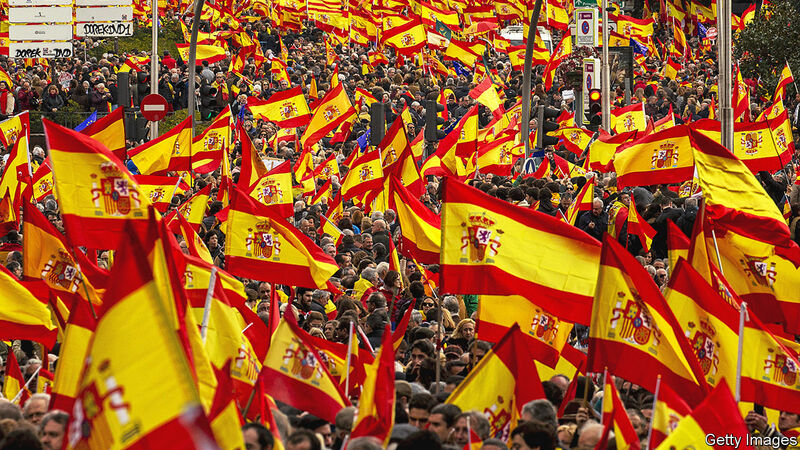 But as the embodiment of the defence of the Spanish nation, the party surged in the national opinion polls. The Catalan events pushed public opinion, traditionally slightly left of centre, to the right. At the last election in 2016 the right won 46% of the vote; today it polls at 55%, points out Kiko Llaneras, a psephologist. The difference is that today the right is split in three, which means it will probably win fewer parliamentary seats. From nowhere, Vox took 11% of the vote in a regional election in Andalucía in December, helping to eject the Socialists from the regional administration they had run for almost 40 years. Mr Rivera’s vetoing of Mr Sánchez is thus a “defensive move” to stop Ciudadanos voters moving to Vox, says Mr Llaneras. It may help Mr Sánchez, in two ways. He broke off talks with the separatists last month, although this contributed to him losing his budget and thus precipitated his calling of the election. He is now seeking votes in the centre ground from which Ciudadanos is retreating. After the shock in Andalucía, where some 400,000 left-wing voters stayed at home, the Socialists expect the spectre of Vox to help get out the vote. The core of Mr Sánchez’s campaign will be about “what kind of country do you want”, says Manuel de la Rocha Vázquez, an adviser to the prime minister. “Do we want a closed, nationalistic, xenophobic, male-dominated society? We strongly believe that the majority of Spaniards are in favour of an open, pluralistic, multicultural, tolerant society,” he says. Although this is the third general election since December 2015, its character shows how quickly the country has changed. The past two were held in the shadow of austerity and corruption involving the PP and the Socialists, who seemed to face extinction at the hands of Podemos, a far-left party. Now Podemos is fading amid internal splits. Mr Sánchez, a politician of no fixed ideology, has hastened that process by feinting left in office, with a big increase in the minimum wage and budget proposals for higher social spending. Instead of the Socialists, it is Ciudadanos and the PP who now have to fight on two fronts. Catalan separatism is Spain’s thorniest problem. But it is Vox, rather than Podemos, which seems to many like the immediate threat to the system. All this suggests that Mr Rivera’s bet on forming a centre-right government is a risky one.